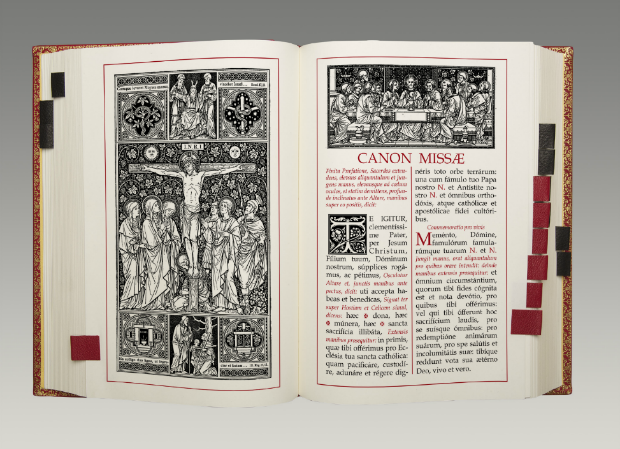 The pre-1955 altar Missal is being reprinted at last! OVER THE PAST twenty years or so, Catholics who criticize the post-Vatican II reform of the Mass have become increasingly aware that the new rite did not appear out of nowhere, and that quite few of its features appeared as trial balloons in the liturgical changes promulgated by Pius XII and John XXIII during the years 1955–1962. It is now common knowledge, moreover, that person primarily responsible for these pre-Vatican II changes was the same man who personally oversaw the creation of the New Mass after Vatican II: Father Annibale Bugnini. I myself have written extensively on the reasons for returning to the pre-55 Missal as part of a program to restore the integral, traditional and timeless Catholic liturgy. The interim forms that paved the way for the post-Vatican II changes, particularly the 1962 Missal of John XXIII authorized by Benedict XVI in 2007, represent transition rather than tradition. For this reason, my book Work of Human Hands: A Theological Critique of the Mass of Paul VI contained an Appendix entitled “Which Missal Should Be Used,” which recommended that all traditionalist groups return to the use of the older Missal. I concluded by expressing the hope that it would one day be reprinted. As the distressing facts about the pre-Vatican II changes became more widely known, there were inevitably more calls to return to the older Missal, rubrics and calendar. However, while excellent Latin-vernacular editions of the older Missal and its companion chant book, the Liber Usualis, together with St. Lawrence Press’s excellent yearly edition of the priest’s Ordo, have been widely available for several decades, editions of the priest’s altar Missal became more and more difficult to find. I am now delighted to announce that this problem has been solved. 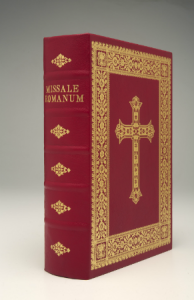 Earlier this month, Roman Catholic Archive, a recently founded publisher of traditional liturgical books, announced that it would print a new and high-quality edition of the pre-1955 Latin altar Missal. This is a project that many traditional Catholic priests have been hoping for for a very, very long time. This Missale is made with the finest craftsmanship available today. The binding is triple-reinforced genuine leather with gold end-sheets that lay flat when open. The gold stamping on both the inside and outside covers is truly suitable for an altar. The tabs are made of genuine leather and the raised bands along the spine are made from natural materials. This Missale is made to last. 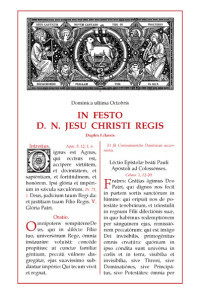 It is published in a convenient 11.5″ x 8.5″ x 2.75″ size (29cm x 22cm x 7cm) that make it suitable for use on larger and smaller altars, as well as a convenient size for serious study. The typesetting and design of the pages shown in the promotional material is very attractive. 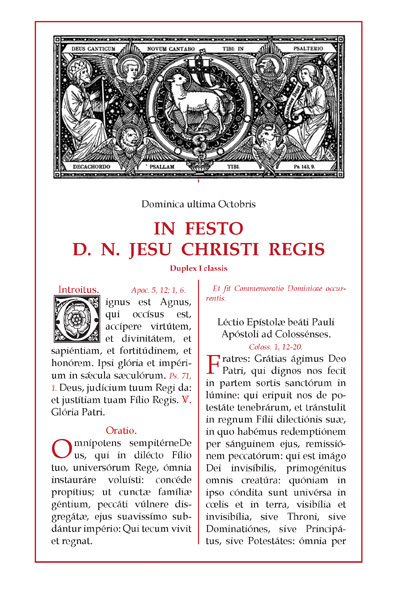 The classic traditional Missal engravings appear throughout the Missal to embellish major feast days. I spoke with the publisher today. He is very committed to this project, and has been working on it for five years. He has invested his own funds in it, and seems highly knowledgeable about all the details involved in a complex project such as this. He was also grateful for a number of practical suggestions I made about details that only a priest (and liturgy fanatic like me) would notice: where to put common commemorations so that they are easily accessible, certain page turns, the number of ribbons, adding a few more recent texts that might have been overlooked, etc. The pre-publication cost of the Missal is $450. This is absolutely worth it for a high quality book that must be used by several priests every day for decades. Every priest and every church using the pre-55 Missal. Obviously! Whatever book is on your altar now is not going to last forever. 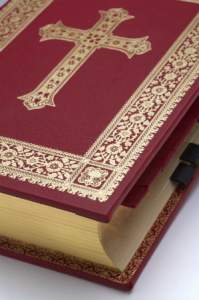 Chances are, the Missal you are using is already wearing out or worn out. Replace it now, or at least buy one to keep in reserve. You never know when one will be come available again. Students of the sacred liturgy. There is absolutely nothing like having a real book, full-sized and with a good binding to use for study, especially for the sacred liturgy, which is conducted in the real world, rather than the virtual one. Priests thinking about using the old Missal. If you use the ’62 Missal, having this new edition will give you a concrete basis for comparing the pre-55 liturgy with the version you are using. The old liturgy is not as complicated as some people claim! The printer and binder require a considerable payment up front, so the more early orders the publisher obtains, the quicker these precious books will be available. Support this project – it is a milestone in the process of restoring the traditional liturgy everywhere — and order a copy or several! Unfortunately, this project was put on hold till further notice. We hope it will be revived at some point in the near future! This was written by Rev. Anthony Cekada. Posted on Wednesday, February 12, 2014, at 6:39 pm. Filed under Liturgy: Misc. Bookmark the permalink. Follow comments here with the RSS feed. Comments are closed, but you can leave a trackback.